* Special release-week pricing! * From the bestselling authors of the award-winning Once Upon Anthologies, the next fabulous volume is here! Revisit your favorite faerie tales, masterfully retold in science fiction settings with delightful, and sometimes chilling, twists. What if the Twelve Dancing Princesses were undead clones? What if the witch in Hansel and Gretel was an AI-sentient house? Are you ready for the Three Little Pigs… in space? These fourteen tales will entertain and inspire you, and you’ll never see your favorite faerie tales quite the same way again. 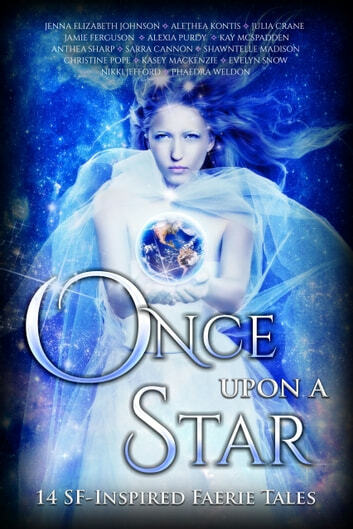 Grab your copy of Once Upon A Star, and don’t forget the other anthologies - Once Upon A Curse, Once Upon A Kiss, and Once Upon A Quest - for more magical retellings! A princess on the run and her feline companion find adventure - and danger - on Starhub Station in this story based on the Icelandic fairy tale Kisa the Cat. The daughter of one of Gaia’s richest oligarchs gets more than she bargained for in her new husband in this retelling of “The Frog Prince” (with just a dash of Cyrano de Bergerac for good measure). Miriana never expected to be murdered repeatedly after refusing an evil prince’s marriage proposal. Now saddled with eleven undead clone-sisters who spy for the murderous prince, she’s going to save the day with her forbidden soldier lover—or die trying - one final time. Read more fabulous fairytale retellings from these authors! Love reading anthologies such as “Once Upon a Star”. It gives me an opportunity to be introduced to new authors. The stories were enjoyable having some very short with a semi-cliff hanger ending that left you wanting more. Most importantly I loved Christine Pope’s new Gaian Consortium short story included in this anthology. I read all of Christine’s books and this particular story did not disappoint at all. I highly recommend trying these 13 fairytale-inspired science fiction short stories you won't want to miss! Great mash up of Sci-fi and Fantasy! Loved it! Sci fi fairy retellings at its best! Every story in this Once upon a Star Anthology is set up in the near future and got that Sci-Fi vibes to it! Because kobo has limited characters 2500 words, i could only put 2 reviews. They are all good. my faves below: ECHO By Nikki Jefford A “Pinocchio remake” but sci fi version! Hahaha. I loved it! And is not the Disney version either but the original one before that. I can’t express how cute this was. It had me glue from beginning to end. The curiosity of “Echo” robotic girl got the best of her and landed her in big trouble. She made a friend Proto another robot like her who got her on a sticky situation. The interactions she had with Proto was funny but what she shared with Boomer was special. Boomer was her maker and he did everything to entertain her but she still was a curious cat. She craved the “stars and where the wild things” are. And that got her captive by a poacher. While she was trapped and away from Boomer she made some animal friends and an alien blue friend that were prisoners too. She missed Boomer and wished she could return to him. She finally got her chance to escape but realize she could only save her friends get free. Little did she know her blue friend was powerful and actually helped her become human so she could escape. The reunion with Boomer was warm and beautiful.#bestfriendsfirst A Cyrano Solution: A Gaian Consortium Story by Christine Pope I heart this one so much! The princess and the frog. A “love from a distance” more like it. Marek is an Alien and has secretly liked this specific human girl named Alexa. He made a deal with Alexa’s father and bought her and now is his bride. Is not normal since he is an alien and she is human but he felt this attraction to her immediately. He has his artificial intelligence robot pick her up and bring her to her new home. Alexa is thrilled and a little cautious since she has no idea “who” bought her. He won’t introduce himself yet to her personally uses his AI robot to interact with her while he controls it as if it was him. It has enough backstory and great buildup to know what type of world this is. Both characters were fun to read! He finally gets the courage to meet her and the outcome is perfect. You get that “awww” swoon worthy scene I was waiting for!! I can’t wait to read more stories from this author! Once Upon a Star is a collection of 14 SF-Inspired Faerie Tales, which is a fantastic a different concept for fairytale retellings. Review for Echo by Nikki Jefford Echo is a Pinocchio inspired story, but with a twist on the storyline and characters which is brilliant. Nikki Jefford has done an amazing job creating this story, with Echo being just a mischievous and constantly seeking adventure, as the character the story was inspired by. I highly recommend this beautiful story.